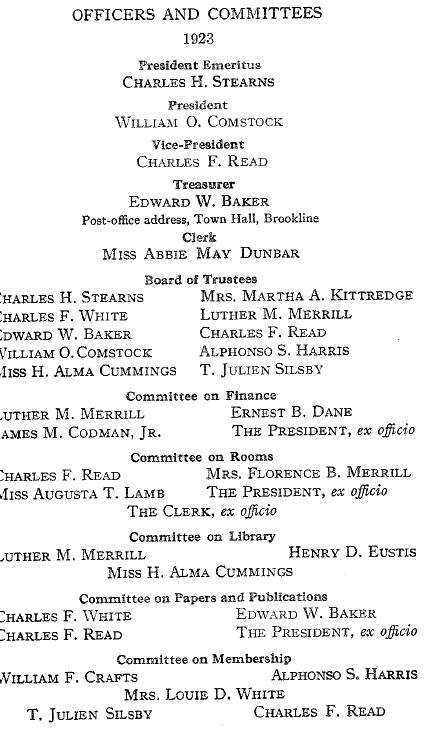 The twenty-second annual meeting of the Brookline Historical Society was held in the Edward Devotion House, Brookline, on January 30, 1923, at 8 p.m., President Charles H. Stearns in the chair. It gives me much pleasure to welcome you to the twenty-second anniversary of the birth of this society, and to make my annual report of the more important events in our town. Our society is greatly indebted to the efforts of our fellow member T. Julien Silsby in securing twenty-six new members. There have been four resignations during the past year, and eight deaths of our members. Emery B. Gibbs, died February g, 1922. Mrs. Eleanor T. Pattee, died May 20. John M. Longyear, died May 28. Mrs. Tirzah S. Arnold, died October 11. Albert B. Hammond, died October 22. James P. Stearns, died November 9. Charles P. Gaither. died December 13. Bordman Hall, died December 31. Emery B. Gibbs was born in Livermore, Maine, and died February 9, aged fifty-nine years. Mr. Gibbs was one of our best-known citizens and died universally respected. He came to Brookline in his early years from his Down East home to live with his uncle, John Gibbs, during his college term. He attended the Harvard Law School and began the practice of the law, in which he was most successful. He was devoted to the Baptist Church, was one of its deacons, and at one time president of the Baptist Social Union. Mrs. Eleanor T. Pattee died in California, May 20. She was the daughter of William Tracy Eustis, who was much interested in our society in its early years. Mrs. Pattee frequently attended our meetings in company with her brother. John M. Longyear was born in New York and died May 28, aged seventy-two years, and had lived in Brookline about twenty-five years. He had resided in Marquette, Michigan, where he had a beautiful home. He bought several acres of land on Fisher Hill, to which he moved his stone mansion, piece by piece, from Michigan. Mr. Longyear was a man of many interests: he was the owner of immense tracts of land containing iron ore; he was the principal owner of coal mines in Spitzbergen, and some of us will recall a talk he gave in our Library hall about that bleak and inhospitable island. He was not a citizen of Brookline, retaining his legal residence in Michigan, of which state he was an official. He was generous of his wealth, one of his gifts being the open lot on Huntington Avenue in front of the Christian Science Church. Mrs. Tirzah S. Arnold was born in Brookline, and died in Hubbardston, Massachusetts, October 11, aged seventy-six. Mrs. Arnold was the youngest daughter of Elijah C. Emerson, a Boston merchant, who built the house now 74 Davis Avenue, which was originally located in the present Emerson garden at the foot of Washington Place, afterwards called Davis Avenue. Mr. Emerson had a beautiful garden with the brook running through it and a lily pond. The house was moved after the town had bought part of the land for a playground. Miss Emerson married Mr. George Arnold, and their home for many years was in Cambridge. They came to Brookline 7 about twenty-five years ago. Mrs. Arnold was greatly interested in our society and attended its meetings as long as her health permitted. She was also president of the Hannah Goddard Chapter of the Daughters of the American Revolution, was active in the First Parish, in the Brookline Union, and in many good works. Albert B. Hammond came to Brookline in 1902, and had a home on 'INaverly Street. He was in the crockery trade. He moved to Cambridge two years ago and died there October 22, aged sixty-six. James Pierce Stearns was born in Brookline February 10, 1840, and died November 9, aged eighty-three. Mr. Stearns was born on the old Stearns estate, attended the Brookline schools and Chauncy Hall, and entered college in the class of 1860. He enlisted in the Union Army in the summer of 1861 as second Lieutenant, 22d Mass. Regiment. He was in the Seven Days' Battle before Richmond in the summer of 1862 and was wounded in the fight at Gaines Mills, where he was captured and taken to Libby prison. He was exchanged in August and taken to Baltimore where his left leg was amputated. Soon after this was healed he entered the Shawmut Bank, then recently organized, and continued there forty years, leaving the bank as its president. Charles P. Gaither was born in Maryland, and died December 13, aged seventy-three years. Mr. Gaither was engaged in the Railroad Transportation business. He had lived in Brookline many years. He was a typical gentleman of the South, and very genial. Bordman Hall died December 31. Mr. Hall was a lawyer, and came to Brookline in 1904. George S. Baldwin was born in Boston, and died February 4 at the age of fifty-six. Mr. Baldwin was widely known and respected. 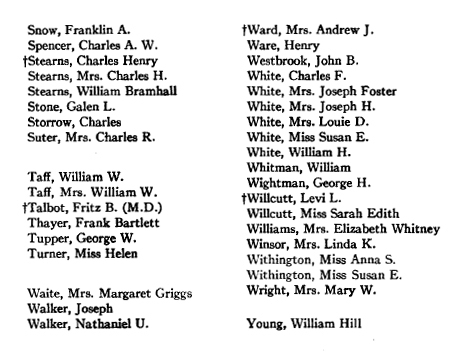 His father, William H. Baldwin, was the founder of the Boston Young Men's Christian Union and its president for many years, and later George was its vice-president. He was in the banking and brokerage business. He is best known in Brookline as a public official, serving for two years as selectman and as a member of the gymnasium and playground committees. He had also represented the town in the Massachusetts General Court. He was a genial and hearty gentleman and had many friends. Thomas B. Wales was born in Boston, and after his retirement from business, he bought an estate on Dean Road and lived there for the past ten or twelve years. He died February 9, at the age of eighty-three. Thomas W. Sparks was born in Provincetown and had lived in Brookline about twenty-five years. He was an assistant to Willard Y. Gross in the care of the Town Hall, and succeeded Mr. Gross as the superintendent of the building. He died February 25, at the age of seventy-three. Michael W. Quinlan was born in Ireland, and came to Brookline many years ago. He was a harness maker by trade and at first had a shop on Brookline Avenue. He later built the factory at the corner of Boylston and High Streets where he did an extensive business in harness and carriage repairs, later in automobiles. Mr. Quinlan was a good citizen, an upright man, and was greatly respected. He died at his country home in Needham, March 25, at the age of eighty-six. Mrs. Helen M. Philbrick was born in Boston, and came to Brookline as a young girl with her parents, Mr. and Mrs. Alfred Winsor. She was the eldest child of a large family. She attended the Brookline schools and married Edward S. Philbrick, an eminent engineer and a well-known citizen. Mrs. Philbrick lived and died in the fine old stone mansion on Walnut Street. She was a very charitable woman, active in the First Parish, in the Brookline Union, and in many good works. She was eighty-eight, and died on April 7. Mrs. Eliza M. Worthley was born in the Argentine Republic. She came to Brookline nearly fifty years ago with her husband, the well-known Treasurer of Brookline. She died April 25, aged seventy-eight years. 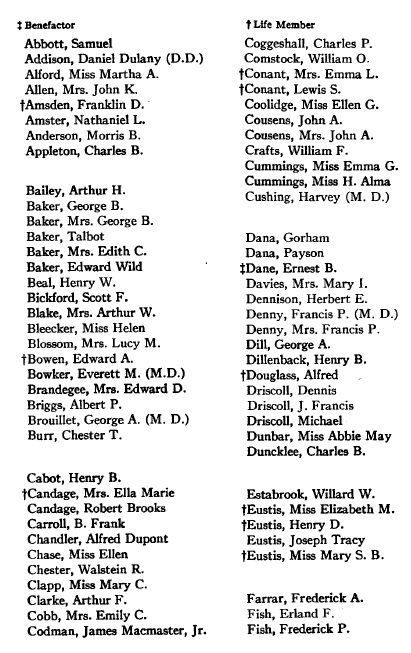 Miss Agnes Blake Poor was born in Andover, Maine, the oldest child of Mr. and Mrs. Henry V. Poor. Miss Poor's early years were spent in New York, but she had been a resident of Brookline for more than fifty years. She was a great reader, and had written many articles for magazines. She was seventy-nine years old, and died on February 28. Mrs. Edith Lincoln was born in Brookline, the daughter of Mr. and Mrs. Moses B. Williams, and a sister of the late Moses and Charles Williams. She married Albert L. Lincoln, our well-known and respected citizen, and died on April 26 in the house where she was born, aged seventy-two years. Mrs. Emma Watts Lewis was born in Thomaston, Maine, and had lived on Harvard Avenue for many years, most of the time a widow. She was aged seventy-three years, and died August 8. Andrew J. Ward was born in Boston and had lived on Tappan Street nearly all his married life. His wife, Elizabeth Davis, was conencted with the Corey family and was born in Brookline. Mr. Ward's interests for many years were in Roxbury, where he owned much real estate. He died August 12, aged seventy-two years. Carl G. Astrom was born in Germany, served in our Civil War, and was a member of C. L. Chandler Post, G. A. R. He had lived in Brookline ten or twelve years and was a photographer. He died September 15, aged eighty-two years. Dr. Henry V. Reynolds was born in Canton. He was a physician and had practiced many years in Dorchester. He came to Brookline about eight years ago, and had endeared himself to many of our citizens. His tragic death at the hands of an assassin, while endeavoring to aid a wounded man, will be well remembered. He died September 21, aged sixty-one years. Dr. Robert W. Hastings, another well-beloved physician, was born in Warren, Massachusetts, and was long a resident here. He was superintendent of the Tuberculosis Hospital, and for many years connected with the Board of Health, and with the schools as a physician. He was active in the Leyden Church. He died October 13, aged fifty-six years. Miss Alice W. Bancroft was born in Worcester, and had lived the greater part of her life on Cypress Place. She was much interested in her garden, in temperance work, and in the Animal Rescue League, to which she made a bequest. She died October 15 at the age of seventy-six years. Michael O'Day was born in Brookline in the building known as the Long House, originally the Downer Mansion. Mr. O'Day for many years conducted a grocery store. He died November 8, aged seventy-four years. Rev. George A. Hall was born in Northampton, a retired clergyman, and lived on Fisher Hill. He had resided here about twelve years and was prominent in the Leyden Church. He died November 19, at the age of sixty-three years. Enoch E. Doran was born in Brookline on Ackers Avenue. He cultivated a small tract of land. He was greatly interested in temperance and voted the prohibition ticket when it was unfashionable to do so. He died November 24, aged sixty-nine years. Miss Melinda E. Raymond was born in Hubbardston, and had lived for many years with her sister, Mrs. Chase, on Harvard Street. She was a very sweet, quiet lady, but quite active and lived to the good old age of ninety-five years and died April 28. Gustaf Lundberg was born in Sweden, and lived in Brookline for nearly forty years on Aspinwall Hill. He was a Boston merchant. He died May 11, aged sixty-nine years. Miss Julia B. Park was born in North Andover. She had conducted the well-known private school on Hedge Road established by Miss Pierce. She died May 11, at the age of forty-four. Joseph D. Richards was born in Boston, and lived for many years on Linden Place, later on Fisher Avenue. He was one 11 of the Boston firm of Doll and Richards, and died May 12, aged seventy-nine years. Peter H. Glancy was born in Ireland, a painter by trade. He worked many years for James B. Hand. He will be remembered by our older citizens as a good workman and a kindly man. He was ninety-four when he died on May 16. Mrs. Susan M. Gross, formerly Miss Rowe, was born in Sharon, Maine, and for many years was a teacher in several of the Brookline schools. She married Mr. Gross and lived many years on Holden Street. She was a member of the Woman's Christian Temperance Union, and of the Baptist church, a much beloved woman. She died June 17, aged seventy-five years. Joseph A. Manning was born in Worcester, lived in Brookline many years, first on Clark Road and later on Buckminster Road. He was in the Boston boot and shoe business, and died June 22, aged seventy-one years. Mrs. Almira C. Berry was born in New Hampshire, came to Brookline with her husband and lived in the house on the corner of Longwood Avenue and Kent Street, where she died July 29, aged ninety-two years. Mrs, Mary Farlow Linder was born in Boston, lived for many years in Newton, and came to Brookline with her husband, George F. Linder. They lived at the Beaconsfield, and afterwards on Warren Street, later on Philbrick Road. She was a most kindly and generous lady and died August 4 at the age of seventy-six years. Miss Frances G. Stevenson was born in Boston, and lived in Brookline for nearly fifty years. She was the last of three maiden sisters who had always lived together. She died on Upland Road, August 4, aged eighty-nine years. Mrs. Emily S. Russell was born in Methuen, and had lived for many years on Allerton Street. She was the widow of Francis H. Russell, who passed away a few years ago. She died December 9, aged eighty-seven years. Silas Pierce was born in Boston and lived for many years in the family home in Scituate. He was the head of the wholesale grocery of Silas Pierce and Co., succeeding his father of the same name. His winter residence was on Harvard Street, where he died. He was interested in the Methodist Church in Brookline. He died December 10, aged sixty-two years. Mrs. Lucilla T. Lawrence was the widow of Francis W. Lawrence, a former Selectman of Brookline and nephew of Amos Lawrence, who owned at one time the larger part of Longwood. Mrs. Lawrence lived on Mountford Street, where she died, December 24, aged eighty years. Patrick Gallagher, born in Brookline, was a Civil War veteran, a member of the G. A. R., and employed by the town. He was a faithful worker, a good soldier and citizen, and died December 20, aged seventy-eight years. 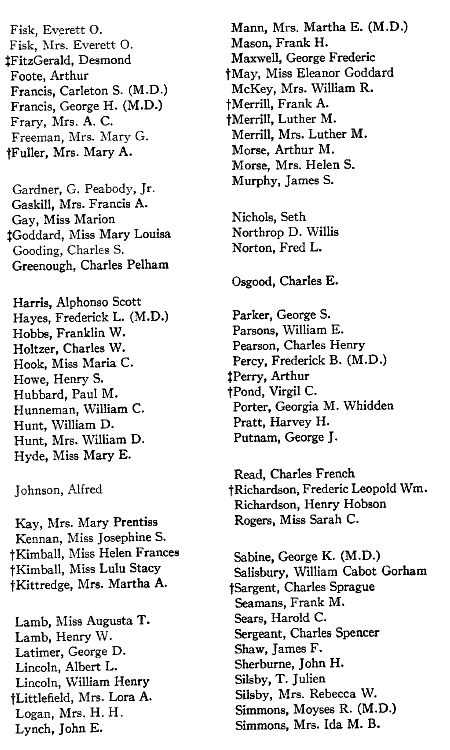 Three of the above list were veterans of the Civil War. We have had four meetings of the society, three in the Devotion House and one in the G. A. R. Room, Town Hall. 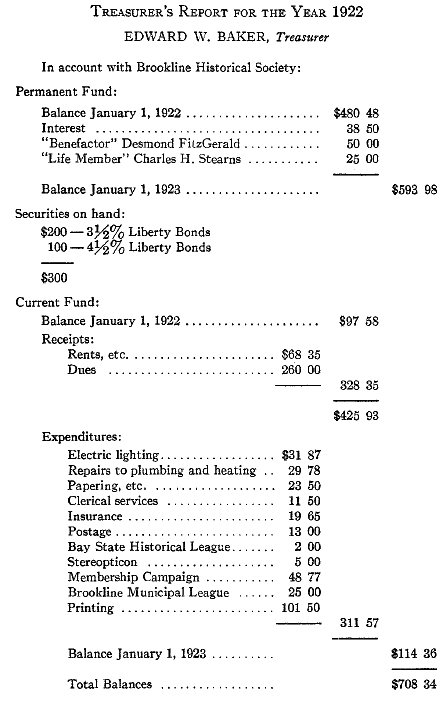 January 26, 1922, was the Annual Meeting, at which officers were elected and your president read his annual report. It was one of the coldest days of the season, but we had a goodly attendance, and the discussion and social talk was very pleasant. March 30, Miss Emma Cummings, one of our members, gave a very interesting talk on the Hawaiian Islands, which she had recently visited. A novel experiment at the Devotion Bouse was made with the stereopticon, which was a great success. A number of beautiful pictures were shown and a most interesting talk was given by Miss Cummings. The room was filled and it was a most entertaining evening. May 31, Mr. Marshal P. Thompson gave a most interesting and thoughtful talk on the character and life of General U. S. Grant. He gave in particular an account of Grant's life after he had left the Presidency, and of his sterling worth during the days of his financial troubles, and his courage during his long illness. 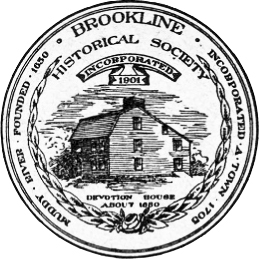 November 13 at the Devotion House, Mr. Edward Baker gave one of his characteristic and pleasant talks suggested by the date, which was the 217th anniversary of Brookline as a town. Mr. Baker showed by plans and maps, which were displayed on the screen by the stereopticon, the growth of the town, coming down to 1887, when the widening of Beacon Street took place. His pictures along this street before the widening and the same places after, showed a most startling contrast. Mr. Baker was listened to by an audience which completely filled the room, and it was one of the most interesting meetings we have had. January 14 at the Dorchester Meeting House, under the auspices of the Dorchester Historical Society. Mrs. King, the historian of the Dorchester society, gave an interesting talk, also Mr. Lewis the president. April 29 at Taunton, at which your president was not present. September 30 at Worcester, The Worcester Historical Society has a beautiful home and a large collection of relics. Mr. Cutler, the president, gave the delegates a warm welcome, and read an interesting paper on the growth of the society and its aims. Mr. Bullock gave a paper on the growth of the town and city, and a member told of some of the noted men of Worcester and read letters written by John Adams, who in his early years taught school in Worcester. Our town continues to grow, and during the past year much building has been done, particularly in stores, seventy-two of which have been built or are in process. As was said in the last report, this form of building is being overdone. There are now scores of vacancies, and these one-story structures sandwiched in between dwelling houses are not artistic; and not being content to build on vacant land, several houses have been torn down for the erection of stores, According to the building department, permits for 117 wooden houses for one and two families have been granted, though these were not all built; and for brick and stone one, two, and three apartments, fifty-three permits were issued. To show the almost universal use of automobiles, 157 permits for private garages have been granted, and seventeen for large and public ones. An application for the projected hotel near Longwood Station to contain eight hundred rooms has been filed. As the title to the land for this structure has been passed, this seems to be an assured thing. During the year the large twenty-four apartment building on Beacon and Powell streets has been completed and most of the suites are occupied. In October last the large and handsome building for the Brookline Savings Bank was finished, and the business of the bank was transferred from the building on Washington Street, which had been occupied for more than twenty-five years. This vacant building is now for sale, and a suggestion has been made that it might be a commodious home for our society. The building is fireproof, or nearly so, and it would be a safe place for our antiques and relics, which doubtless could be greatly increased, could the doners know that a safe home for them was provided. It is not likely, however, that such a place could be acquired for a long time to come as the cost would be prohibitive. The large addition to the High School is nearly completed, and is partially occupied by classes. Three dwelling houses have been torn down and, in place of two of them, stores have been or are to be erected, and on the site of the other a large apartment house is contemplated. This last mentioned was the house that stood at 1440 Beacon Street, at the foot of Summit Avenue. This fine house was built in 1861 or 1862 by Edward A. Raymond. He soon after died, but it remained in his family until 1893, when it was sold to George W. Mitton, then the president of the Jordan Marsh Company. The house was enlarged and the grounds beautified by trees and flowering plants, and it made a fine appearance on that crowded thoroughfare. Mr. Mitton died in 1912, but his family occupied it until 1917, when it was sold to a speculator, who soon after sold it to the Beacon School, which for a time was quite successful, but owing probably to the great value of the place, and the high cost of maintaining it, the owners had to give it up, and the property was sold. The buildings have been demolished and probably large apartment houses will be erected. It did seem a pity that this beautiful and valuable property should have to be destroyed. Another piece of property that has had a similar fate was the Pierce property on Harvard and Webster Streets. The house was built about 1850 by Moses C. Warren, an old-time hardware dealer in Dock Square, and soon after was sold to William Bramhall in 1851. Mr. Bramhall was a Boston merchant of the firm of Bramhall and Howe (Thomas Howe, who lived many years on Linden Place). Mr. Bramhall had a large family who were prominent in Brookline society between 1850 and 1860. Mr. Bramhall moved to Boston in 1859, and the place was sold to Henry Pierce of the firm of Wason, Pierce and Co., wholesale grocers. The property has been held by Mr. Pierce and his decendants until the summer of 1922, when it was sold, and an immense public garage has been built on the Webster Street front, and a block of ten stores has been commenced on the Harvard Street front. The third instance of the removal of old houses for modern uses, and the most interesting historically, is the old building that has stood for fifty years or more on the corner of Harvard Street and Harvard Place, and occupied by small stores and shops on the lower floor, and with rooms for lodgers above. This old house originally stood on the next corner above, on what is now Harvard Avenue. It stood on a high bank and with a steep driveway, which has since been cut down, and was a fine specimen of the square New England homes. Itwas built for and occupied for many years by Stephen Sharp, better known as Squire Sharp, and whose name appears in the town records appended to every town-meeting as town clerk for thirty-five years, from 1778 to 1813. Brookline town clerks have an enviable record for length of service. Squire Sharp was also town treasurer for twenty-two years, as well as selectman, moderator, and on many important committees. I quote the following from Miss 'Wood's history of Brookline: "Esquire Sharp was never married. He was a teacher in the little old schoolhouse in School Street1 for many winters, was a justice of the peace and town clerk for many years. The Squire was a somewhat stern and gruff man in his ways, and not very popular with the children of the neighborhood and was known by them by the nickname Grumpy. He died in 1820." The Sharp family was one of the earliest settlers of Muddy River, Robert Sharp coming here in 1650, and owning at one time most of the land on both sides of Harvard Street between School Street and nearly to Beacon Street. There were five generations of Robert Sharp, several of them being killed in Indian Wars, Stephen being the son of the fourth Robert. The name in Brookline of this family is now extinct. The place of the old house is now occupied by four stores. A notable and most desirable event in the town affairs has been the passing of the Zoning Law, which divides the different sections of the town into zones, in some of which certain buildings for factories and stores may be erected and used for trade and in others where dwelling houses only shall be built; others in which large apartment houses and hotels can be erected. It is a wise law, and the pity is that it was not passed earlier, as so many stores have been erected in what seemed the residential districts. And now, my friends, in closing, I must tell you that this is my last appearance as your president. I succeeded Captain Candage in 1910, so the past year has been the thirteenth that I have held the office. I have enjoyed it thoroughly and I shall have pleasant memories of our meetings. It was perhaps meet that I, a life-long resident of the town, should have been elected to the office, and I have endeavored to give from time to time what I have remembered of its growth and principal events. I have been favored too with opportunities to glean from the records of the town, and am especially indebted to our treasurer for his assistance in preparing some of my papers. I resign now, not on account of any falling away of interest, but naturally there comes a time to one of my age when he feels that he should give way to another, and I assure you I shall still continue as an interested member and be here (D. V.) to listen to my successor. This two-story building stood at or near the foot of Prospect Street, which was laid out after the building was removed to the corner of Washington Street and Davis Place, where it did service as a drug store for a number of years.